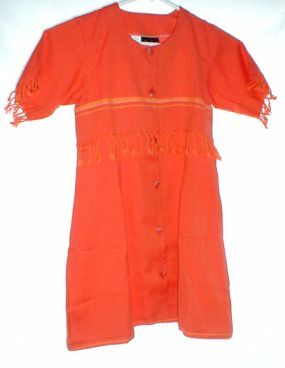 This delightful bright short sleeved cotton kikoy girl’s dress is sized to fit a child between six and seven years old. To assist you with the fit we provide these measurements. It measures 12″ from shoulder to shoulder and 27″ from the shoulder to the hem. It is short sleeved and has 6 orange buttons in the front.